Breast cancer is one of the more survivable cancers, thanks in part to large strides in education, treatment and post-cancer care. An American woman diagnosed with breast cancer in 1975 had about a 75 percent chance of surviving for five years post-diagnosis. Today, that rate hovers around 90 percent, according to the latest statistics. But not all women have benefited from these advances. Black women currently have a national survival rate of 79 percent. In other words, the average contemporary black woman has a survival rate on parity with a white woman from the 1970s. Black women haven't benefitted from advancements in breast cancer treatment to the same extent as their white counterparts due to factors that include socioeconomic barriers and lack of access to the most comprehensive health services. 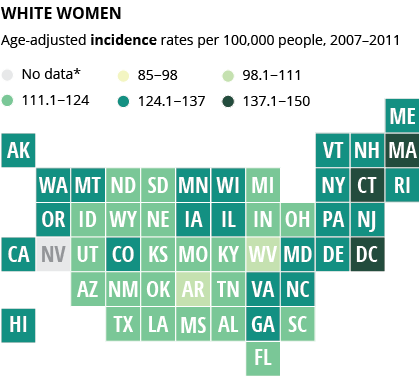 "The advancements in screening tools and treatment which occurred in the 1990s were largely available to white women, while black women, who were more likely to be uninsured, did not gain equal access to these life-saving technologies," Bijou Hunt, an epidemiologist at Mount Sinai Hospital in Chicago who recently published a study that examined racial disparities among breast cancer survivors, told Reuters in March. To be clear, survival rates are improving for both white and black patients. But white patient survival rates are improving at a dramatically faster pace, creating a growing chasm between the groups. That's particularly noteworthy because white women have higher rates of breast cancer in the first place. Hunt's study focused on city survival rate disparities. 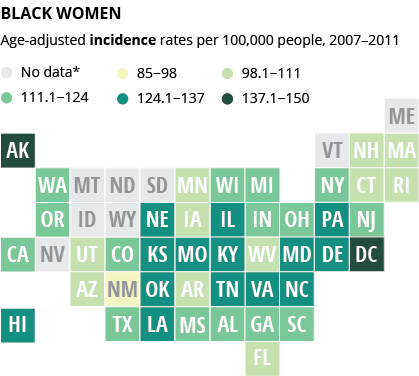 Nationally, black women are 40 percent more likely to die following a breast cancer diagnosis. But in some cities, that rate more than doubles. Los Angeles residents, for example, face a 71 percent disparity, while Nashville, strikingly, has a 111 percent disparity. "I'd wager that these types of cities have high concentrations of African-Americans," Dr. Karen M. Winkfield, a radiation oncologist and assistant professor in the department of radiation oncology at Harvard Medical School, told The Huffington Post. For example, Winkfield said, black residents comprise 24 percent of Boston (which is fifth in the nation for mortality risk disparity) but only 6 percent of the entire state of Massachusetts. In this sense, the city view is more representative of barriers faced by black cancer patients. One often-repeated explanation for these disparities is that black women are more likely to have aggressive forms of breast cancer that don't respond to treatment. While some research does back up this claim, it doesn't begin to tell the whole story. In fact, Hunt's city-level study helps put the debate over genetic differences to rest -- since mortality rates vary so widely between cities, genetic differences between racial groups cannot possibly explain them. Socioeconomic factors, which include income, education, and occupation, are often divided along racial lines and also have a direct, correlative effect on health. The socioeconomic status of a patient's neighborhood is even correlated to health outcomes (like age at death). Problems entrenched in socioeconomically disadvantaged communities, like a lack of medical understanding and fewer resources for care, contribute to poor health -- as does, it has been well-documented, the stress and psychological toll of poverty. Despite the Affordable Care Act, studies have shown that many disadvantaged patients with chronic diseases remain underinsured. In Boston, where Winkfield works, a universal health care system has been in place since 2006. Although more than 90 percent of residents have some form of health insurance, state-of-the-art care and experimental drug trials aren't available to everyone. For many women in poor neighborhoods, the imaging centers and doctors offices that offer checkups and mammograms -- two primary modes of early detection associated with better survival chances -- are simply inconvenient and out of reach. And some of the city's top hospitals don't accept low-income insurance policies easily or at all, Winkfield explained. Even if they did, access is about more than feasibility. Research shows that doctors often have unconscious biases toward patients of other ethnicities. Immigrant patients, who are often people of color, also struggle with language and cultural barriers that can make a hospital feel unwelcome. (Hispanic and Asian immigrants struggle with these barriers as well, though these populations were not explored in depth in the study). "It's about people feeling welcome at institutions," said Winkfield, who is the only black radiation oncologist in Massachusetts and one of only three in New England. "Institutions need to do a better job of changing the landscape [and] considering workforce diversity. Even if the rate of black doctors is currently static, what about staff? Information desk attendants and volunteers -- you can change the face of what your institution looks like." Moreover, many of the most exciting medical advancements that have put a significant dent in breast cancer mortality began as clinical trials, which skew white. Black people represent just 5 percent of clinical trial participants, and researchers find that minority (and female) patients are harder to recruit. Clinical trials come with some financial burden that make them impossible for the socioeconomically disadvantaged: Aside from missed shifts, a weekly visit to the hospital could mean losing a job for many wage workers. Single parents often cannot afford the extra time away from home without childcare options. And bare-bones insurance programs don't often cover the full cost of associated treatment. While a handful of financial assistance programs, such as MD Anderson Cancer Center's Uncompensated Care program and the Lazerex-MGH Cancer Care Equity Program do exist, it's too early to tell how effective they are. "This is a clarion call," Winkfield said of this latest study's startling view of health disparity. "The good news is we can develop the resources to [fix] it."